Not in the mood for reading today? Check out the training video instead! Step 1: Who are your recipients? If you want to send your statements to only donors meeting certain criteria, or if you want to include a mail merge letter with your printed statement, you will need to set up a DataMiner Platinum batch to select your contacts. There are tons of DataMiner Platinum videos on the help site, but here's a great training for beginners. If you need help building your query, contact our support team. 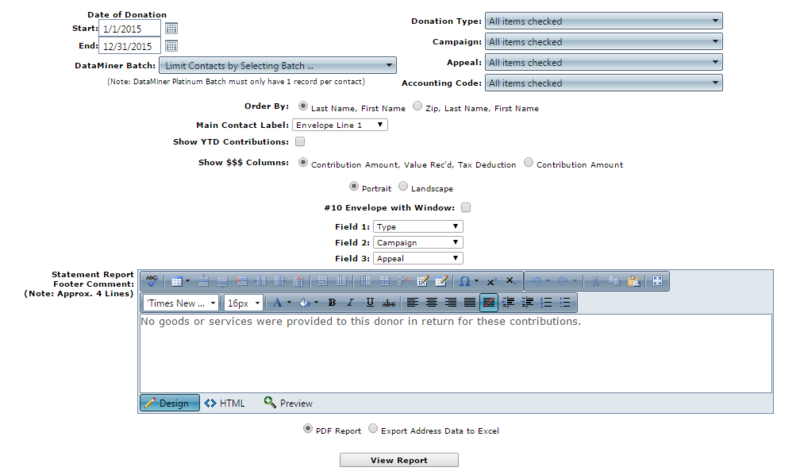 Go to Reports > Donation Activity > Contribution Statement where you will see the above screen. Adjust your date range and any other settings that you would like to include. Clicking the View Report button will start downloading your statements as a single PDF file that you can print. If you are using window envelopes, select Portrait for the report orientation. This will display the option to adjust the report dimensions so that the destination address will fit inside a standard #10 window envelope. Step 3 (Extra Credit): For those of you who would like to include a mail merge letter along with the printed statement, you can use that same DataMiner Platinum batch to generate a mail merge letter in Word or generate a simple text letter in DonorSnap. If you just want the name and address data for creating a mail merge document outside of DonorSnap without any user defined fields or extra information, you don't need a DataMiner Platinum batch. At the bottom of the report generator, choose the "Export Address Data to Excel" option before clicking the button. One Final Tip: Some organizations love to print directly onto their envelopes. All you need to do is create a mail merge document in Word using the mail merge wizard. Select the option to create an envelope and then use the DataMiner Batch Letters tool in DonorSnap. Check out the Envelopes and Labels Training Webinar for more detailed instructions. In just a few clicks, licks, and stamps, your statements will be in the mail well before the federal deadline! If your tongue is unhappy with you after licking all those envelopes, maybe it's time to resolve to move to emailed statements next year. For the low cost of free, you can mail merge an email, attach pdf statements, send all of your statements in one batch! The best practice is to ask permission from your donors to email their statements when you collect their email address. For more details, watch the Contribution Statement Email overview video. Don't forget about the potential savings in postage costs! That savings alone could cover the cost of your DonorSnap subscription several times over. Did I mention it's free? Email Acknowledgement Letters are free too!